Tetris in reverse. 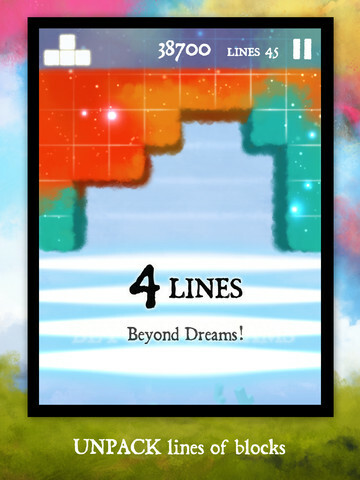 That's the easiest way to describe Dawn of Play's outstanding iPhone and iPad puzzle game, Dream of Pixels. It's the sort of thing you need to see in action to fully understand, and even then, it may take several minutes to get the hang of things, largely because it forces you to unlearn the familiar block-falling play that was likely stamped onto your brain at a young age. Once you finally grasp the concept, though, you'll immediately fall in love with what is arguably one of the finest titles not just on mobile, but gaming in general. Picture it this way. Instead of beginning with a blank screen, a giant mass of blocks slowly makes its way from top to bottom, Tetris lines already formed. Meanwhile, the game displays the current shape (aka Tetromino) on the top left corner. Your job is to pick out that shape on the grid by highlighting it with a finger, then releasing to watch it drop into the abyss. From there, the game displays the next target shape, and the idea here is to make rows of blocks disappear. Mess up, and you risk stranding blocks in space, but on the positive side, clearing a row causes these detached blocks to move upwards, eventually (more like hopefully) rejoining the huge mass above. Let one block fall below the bottom of the screen, and the game ends. That said, there's a welcome amount of complexity that goes into these maneuvers. Each decision you make ultimately affects the entire board, forcing you to think critically in a small amount of time, a fact that immediately boosts adrenaline levels as you frantically clear Tetrominos as safely as possible. Risks, however, are both common and encouraged. A stranded block is by no means a death sentence, but on the flip side, there's a great chance you just made a critical mistake. Moving on, a wealth of modes round out the package. Classic, where you'll probably spend most of your time, is the standard game type we described. Puzzle, on the other hand, presents you with a carefully designed shape, challenging you to pick out specific Tetrominos in a certain order, with the option to undo moves if you get stuck. Then you have Nightmare, which puts the focus squarely on merging isolated blocks with the main cloud. Great practice for Classic mode. Oddly enough, the game's presentation was designed to relax players amid controlled chaos. Blocks resemble puffy clouds of different colors, and the dreamy music will definitely help you relax after a troubling day; to be fair, Dream of Pixels resembles an N64 game from the 90s, and we're not sure if that's such a great thing. Despite our praise, we can't help but feel the game works against us, specifically when it comes to block placement. It can be difficult, perhaps more than necessary, to notice a potentially isolated block as you highlight a Tetromino. Human error probably accounts for roughly 97 percent of the experience, but you'll never shake that three percent, or the thought that the computer's the slightest bit unfair. We cannot understate this: had Nintendo published Dream of Pixels in the 90s as some follow-up to Tetris, the publisher would have sold at least a million more Game Boys. It's that phenomenal. The graphics, audio and thoroughly addictive play come together beautifully. Suffice to say, if you can only buy one iOS game this week, make it this one. Yes, you'll see blocks in your sleep. 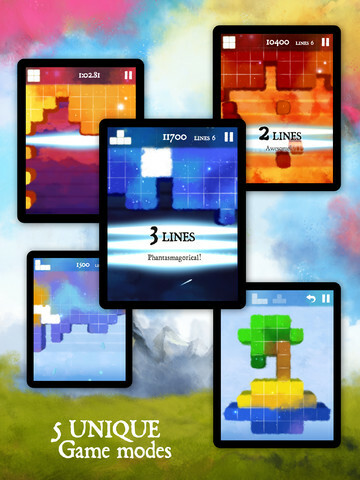 What's Hot: A re-imaging of classic Tetris, dreamy mood music, five unique modes, extremely addictive. What's Not: Graphics resemble a Nintendo 64 game, default shape placement seems unfair at times.